Many years ago, I was out walking in the woods. It was a sunny winter’s day and a white blanket of snow enveloped the land. There were many animal tracks in the snow, but what really caught my eye was a pair of human footprints, as if someone had been out walking barefoot in the snow. Curious, I crouched down and crawled through the tight entrance into the hut. Inside, there was a fire, and on the other side of the dancing flames was a woman unlike any other woman I had seen before. Her hair was long and thick, full of spider webs and crawling things. Her eyes were dark and bright, like glowing coals in the night. She wore many layers of skins and furs, and her bare feet looked as though they were made of old bark. 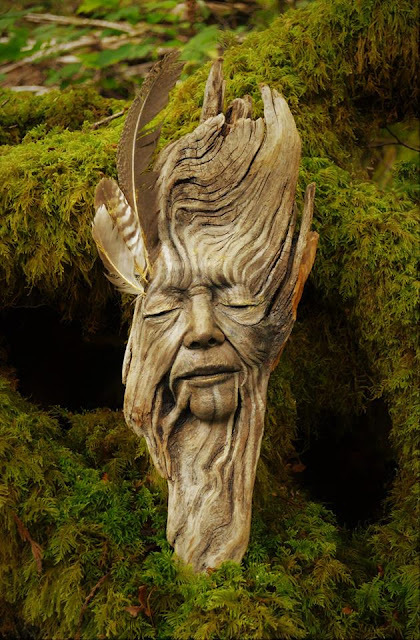 In those days, the woods sang with the sound of the woodswomen – their singing, howling, drumming and dancing, and the gentle whisper of their ever-watching presence. The woods were alive with the magic of the woodswomen. 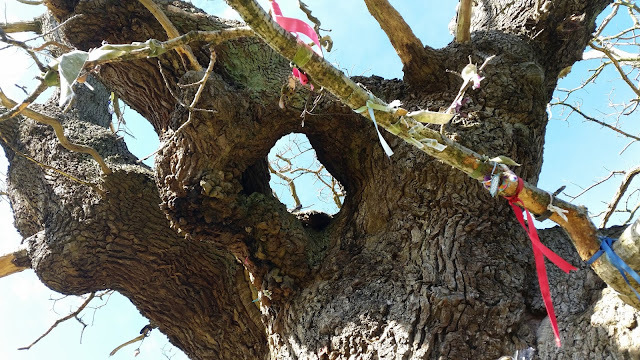 Among the birch, spruce, oak and pine, they were home in the woods on beds of moss and with ceilings of lichen growing like beards from the trees, hanging from crooked branches reaching up for the stars. Some woodswomen preferred to live alone in the heart of the woods where they could tend to their own magic, whereas other woodswomen lived together like families and made the simplest of chores a lot of fun with much laughter and singing. Some woodswomen were most at home living together with bears and wolves, and then there were the travelling woodswomen who carried their homes with them wherever they went. 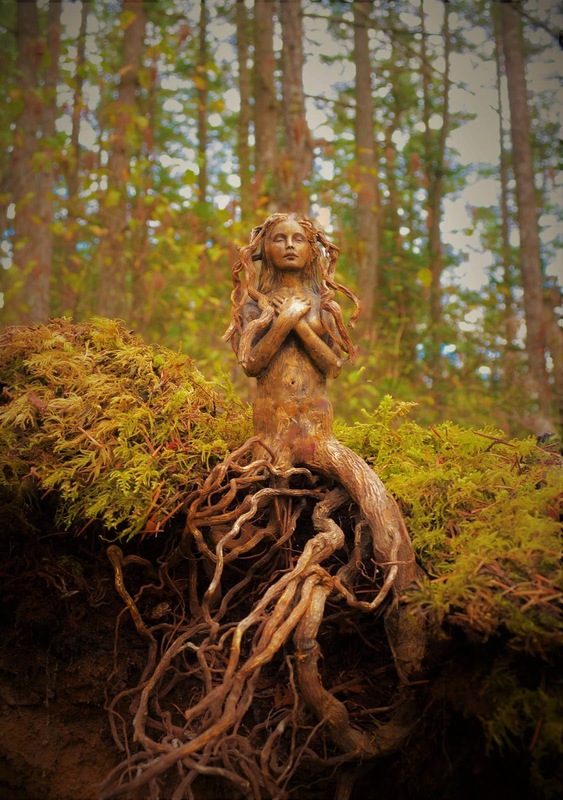 The woodswomen were guardians of the woods and keepers of the woodland lore. They knew the woods like the back of their hands and watched over all who lived there through autumn, winter, spring and summer; seeing that all was well, all was in balance and as it should be. In their keeping was the very heart of the woods and in order to protect and preserve it, they had to keep it drumming by the singing of its songs, the telling of its stories and the remembering of its ancient medicine. The woodland lore was once common knowledge, known and respected by all. Following in the footsteps of the woodswomen, the people learnt from an early age how to walk in tune with the heart of the woods. The people were friends of the woods and the woodswomen gladly shared their knowledge with them. In return, the people helped the woodswomen preserve the woodland lore by the singing of its songs and remembering of its ancient wisdom. Not only did they help preserve it, they brought it to life by the spirit of their own songs. The woodswomen’s hearts of gold shone all the brighter by the love of the people and the woods thrived as never before. But what happened to the woodswomen? And why have the woods become so, so silent? There are many songs and stories about that time so long ago. Some say that the woodswomen never left and that it was in fact the people who really changed. Over time, the people left the woods, and instead of calling it home, as they once did, they began calling it the wild. The people become townspeople and their children grew up learning that the wild was a dangerous place full of dark and menacing creatures. Among the townspeople were few who could still hear the whispers of the trees. It is said that the woodswomen used to stand at the edge of the woods, looking out over the fields, towns and villages. Together, they sang a song so sad, so grey, dark clouds filled the skies and drenched the earth with rain. Some of the townspeople felt a sorrow they could not explain and children cried without knowing why. The woodswomen’s tears fell upon the earth and the Great Mother took them with her loving hands and laid them gently down to rest. Many things have been said about that time so long ago and we may never know the full story. What we do know, however, is that the woodswomen are returning. I have met them in the woods and heard stories from all over the world about the return of the woodswomen. And isn’t it an extraordinary thing that the woodswomen should return now – now when we need them most? We can help the woodswomen return to the woods by returning home to our own roots and remembering how to walk in tune with the heart of the woods just like the woodswomen showed us a long time ago. There is an ancient path into the woods that we all know deep inside, although many have forgotten how to find it. Stories are for sharing, so please feel free to share this story with your friends but remember to credit me as the author and link back to my website. Thank you to the sculptor and storyteller Debra Bernier for allowing me to use her beautiful images and sculptures together with this story. 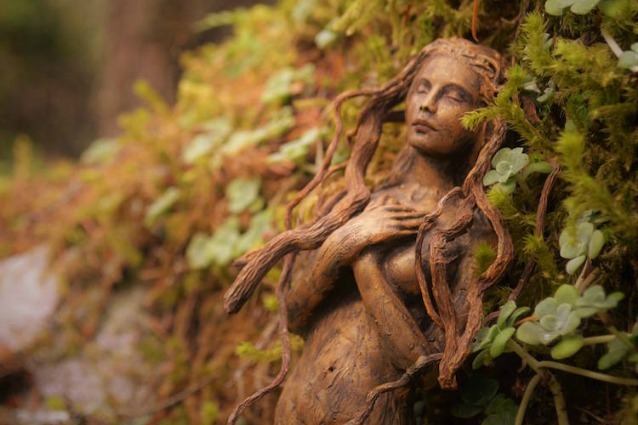 For more of Debra’s enchanting Shaping Spirit Scultures visit her website or Facebook page. Beautiful voice leading me deeper into the woods. Gorgeous story that resonates deeply with me.